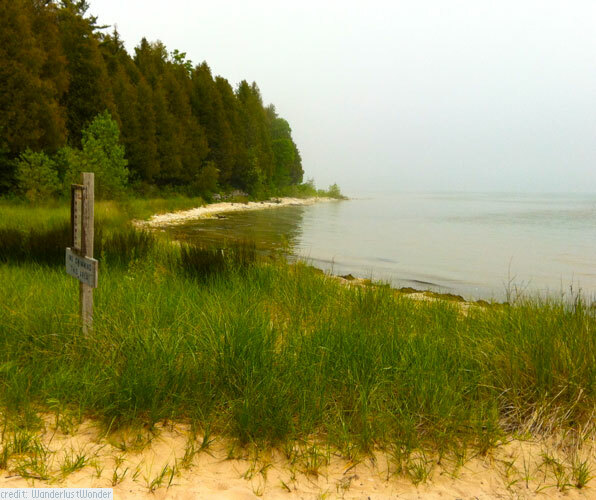 If you visited one of idyllic Door County’s beaches every single day, it would take you nearly a month because since this lovely, scenic area of Wisconsin is located on a peninsula which juts out into Lake Michigan and there are plenty of beaches. This means, of course, that Door County is a great vacation for a girlfriends getaway if you enjoy beaching. However, astonishing beautiful beaches are not the only thing this area often referred to as the Cape Cod of the Midwest has to offer. A myriad of comfortable rental homes and condos, along with hotels and resorts offer plenty of places to stay. We picked a cozy chalet at the Little Sister Resort, located right on Little Sister Bay, and it was the perfect choice. The Little Sister Resort is tucked away in the woods and hidden from the road so look carefully for the sign leading to this charming location. After checking in at the office area which doubles as the dining room for the full, hot breakfast that is included with your rate for every member of your group (what a great amenity! ), we drove a few yards back to our chalet which was perched on a hill overlooking the water. 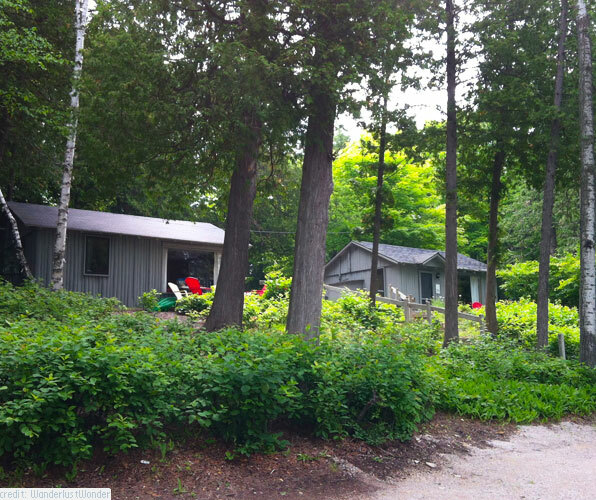 In addition to our perfect two bedroom chalet which is beautifully furnished and has a full kitchen, the Little Sister Resort has dozens of different chalets, cabins, and homes with varying configurations and number of bedrooms, many of which overlook the calm water of Little Sister Bay. There are actually four chalets in one building but we never heard any noise from the others staying above us. There was plenty of parking with a small lot right beside our chalet and another one beside the quiet road where we hardly saw any traffic during our stay, except for the guests of the resort. After settling in and unpacking, we wandered around the resort grounds for a while, surprised at how beautiful the area was, how many different types of accommodations were offered, and how many people were all around, just enjoying themselves. Families and groups gathered around in a circle in lawn chairs on the grassy areas, riding bikes, relaxing on the dock in the surprisingly comfortable provided lounges, or having a bite to eat at the restaurant on the grounds, Fred and Fuzzy’s Bar and Grill. After seeing just how many people were enjoying Fred and Fuzzy’s, we decided to stroll down there for dinner. After our long drive, we really appreciated the fact that there is a restaurant right at the resort. Overlooking the bay, the restaurant is a great place to relax and watch the sunset, which is just what many guests and residents in the area do every pretty summer evening. 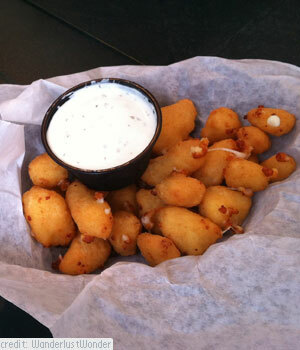 One of the many culinary delights that Door County offers is a local specialty called fried cheese curds. Local chunks of cheese are dipped into batter and fried and they are scrumptious! We had cheese curds every single day of our visit as we knew we wouldn’t find them anywhere else and I have to say the ones at Fred and Fuzzy’s were really the best. Hot, golden brown, fresh and delicious and add in a water view? Oh, yes. After a great night of sleep in our chalet, we checked out the full, hot breakfast at the resort. The quaint and lovely, cedar-lined dining room turned out to be one of our favorite places to eat and we ordered everything from home-baked pastries, eggs and egg dishes, a variety of pancakes, French toast, breakfast meats, fresh fruit, yogurt and oatmeal. The friendly waitress offered a choice every morning and we often ordered both choices – just a sample of course! After we sat down, she would come to our table with a plate of some delicious, freshly baked pastry – a different choice every single day. One of our best breakfasts was the day we had cherry pancakes. Door County is full of cherry orchards and these tart, delicious cherries are good in pretty much anything. Be sure to pick up some jars of cherry pie filling in one of the little stores before you head home as these make the best cherry pies you have ever tasted! There are bikes tucked under the deck of the dining area which are for anyone to use who is interested as Door County is a great place for bike riding. After breakfast, we decided to enjoy the bright, warm, sunshiny morning at the Little Sister Resort dock area, which is one of the nicest I have seen. There is plenty of room on the dock to sunbathe and enjoy the view and I couldn’t get over how nice the wooden lounge chairs were. Furnished with new, thick cushions, they were the perfect place to hang out. Whether you want to swim, sunbathe, or enjoy watersports, the dock has a great view of the surrounding bay. Little Sister Resort offers a lot of amenities but one of the nicest is the fact that they have non-motorized watersports available all the time at no charge. Paddleboats, canoes, kayaks, and stand up paddle boards are spread along the beach for anyone to use and we spent the day checking them all out. The water in the bay was crystal clear, although pretty cold! 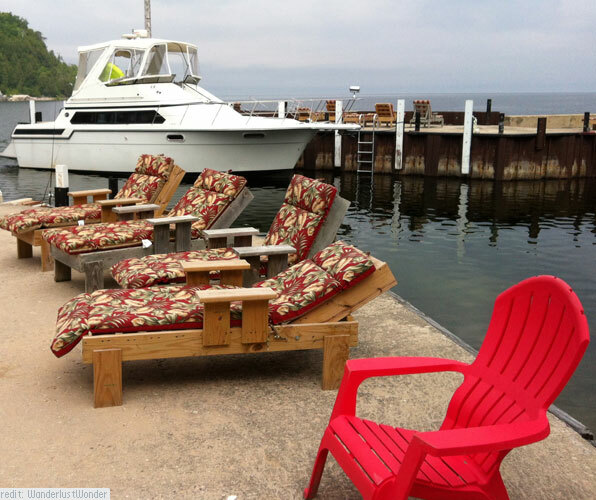 This resort is truly a great place to stay in Door County. In all honesty, I was astonished at how reasonable the rates are, especially for a very nice, full furnished chalet! We could have cheerfully spent our time just relaxing in our chalet or by the lake, but we decided we should really see more of Door County. Door County is actually named after the strait between the Door Peninsula and Washington Island, one of many island that dot the lake. The strait is where the waters of Green Bay meet the open body of Lake Michigan and was treacherous for shipping, so the French named it “Porte des Morts Passage” which in English means the “Way to the Door of the Dead” or simply “Death’s Door”. This became simply Door County, which is comprised of several communities, villages, and towns, each of which is more enchanting than the last. Full of little shops, restaurants, and nice beaches, each town has its own charm. Home to five of Wisconsin’s state parks, which are known as the “five jewels in the crown” and offer sightseeing, hiking, camping, swimming, fishing, and plenty of winter activities as well, Door County also has 12 lighthouses, most of which were built during the 19th century and some of which can be toured. We decided to start exploring Door County in the nearby town of Sister Bay. Thinking it might be it might be nice to see Door County from the water, we booked a cruise with Shoreline Charters, which has several different cruises that tour the area. We chose the Coastline, Cliffs and Caves cruise which gave us some great views of the area. After some shopping in the area and napping in the afternoon, we went back to Sister Bay to dine at one of the most unique restaurants in the area. Al Johnson’s Swedish Restaurant in Sister Bay is famous for their grass roof and the resident goats which clamber right up there on wooden stairs and spend the day grazing and posing for the tourists. It’s pretty interesting and makes a great photo opportunity. Try the Swedish meatballs since you are in a Swedish restaurant and that’s what you do! Plan to spend some time in the gift shop as well since it’s huge and has a lot of interesting and unique items from Sweden, especially beautiful sweaters and jewelry. The next day, we decided to spend some time in the neighboring town of Egg Harbor where we had noticed a lot of interesting shops and restaurants, along with what looked like rather large painted eggs scattered all over town. We stopped in one of the shops and found out that they were indeed painted eggs. Egg Harbor was having an Eggstravaganza in honor of the 50th anniversary of the founding of the town. 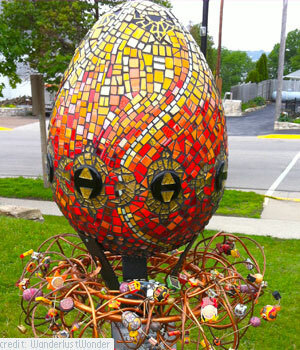 Local artists created all manner of gorgeous and fascinating eggs that were displayed all over town. We picked up a map and proceeded to check out most of the 50 eggs on display. After a morning viewing some very artistic eggs, we headed up the road to the Landmark Resort, a gorgeous location overlooking the lake where they had kindly invited us to use their beautiful outdoor pool as this was the one amenity we lacked at our resort. We stopped for lunch at the wonderful Carrington Pub and Grill which not only has great food but an astonishingly beautiful view from their patio. The view was just as fabulous at the pool, where we lounged in the sun the rest of the day. On another pretty day, we decided we had not spent quite enough time in Egg Harbor so we lazed the morning away on the beautiful little beach which is right beside the downtown area and very easy to find. Immaculately clean with crystal clear, sparkling water, it was a great place to relax and enjoy the sun. The only other beach we managed to fit into our visit was at White Fish Dunes State Park where we ran into cool and foggy weather, so we need to plan another visit to check out the other beautiful beaches in the area. After shopping the afternoon away, we decided on dinner at The Cookery in another little town close by, Fish Creek. The Cookery ended up being our very favorite place of the entire trip and our meal there was absolutely the best we had anywhere. The Cookery is not only a fabulous gourmet dining experience but the family owned and family run restaurant prides itself on using locally sourced products. The wine bar upstairs offers a variety of wines, small plates and desserts and even has live music. Their goal is to incorporate fresh ingredients focusing on local products from Door County and to bring delicious, homemade food to their customers and their food is all that and more. I tried the “four berry baked brie”, which had jam and carmelized onions in a puff pastry for an appetizer and a perfectly prepared New York strip for the entrée. Perfect choice! While you are planning all your delicious meals in Door County, be sure to plan to attend a local fish boil because a fish boil is not just a meal but a work of performance art. At some point in the past, a group of people decided to take some Lake Michigan whitefish, throw it into a pot, and boil it. The boiling pot of water, filled with fish and potatoes, is allowed to boil until the natural oil from the fish rises to the top. Then, the crowd is asked to stand back while kerosene is thrown on the file, it flares up, and the top skim of oil boils over into the flames. The fish and potatoes are then ladled out and served buffet style with cole slaw and bread. The fish can be a little bland but cover it with melted butter and it is known as “poor man’s lobster” and is actually pretty good. Fish boils are offered at several restaurants in Door County but the White Gull Inn offers a nice dinner for a very reasonable price. So, eat your way through Door County, enjoy the beautiful beaches, shopping, and activities. You will find the “Cape Cod of the Midwest” the perfect place for a getaway! Well in addition to learning about Door County which is somewhere in the back recesses of my mind I learned a completely new thing – fish boils! It has to be a man who came up with that way of cooking! I don’t think food doused in kerosene sounds healthy but it’s interesting to read about! I have to agree Kay:) It’d be pretty spectacular to see it in action though, a kerosene flambe!